He is a fairly entrenched incumbent in a district drawn favorably for his party. That fact has helped U.S. Rep. Keith Ellison (D-MN) raise more than $650,000 in his bid for a third term in Congress. That amount includes $173,000 in political action committee contributions from interests ranging from organized labor to health insurers and trial lawyers. As a lifelong (almost) Democrat, it is more than a bit sad to watch as the party of Roosevelt, and Truman, and Kennedy remains more committed to political correctness than to America. The "Investigative Project" helps disclose the truth. I would describe it in a slightly different manner: Do we remain a constitutional republic guided by the American Constitution, or do we surrender to a primitive value system rooted in the seventh century? The book "JIHAD" by French scholar Gilles Geppert brings out the Muslim Brotherhood connection which was started in Egypt many years ago. This is a very objective book and is researched very well and is worth a read. My concern is that people, like Ellison, are not distancing themselves from radical groups like the Muslim Brotherhood. Ellison needs to be questioned as to whether or not he would support building a Christian Catheral in the Middle East as a symbol of peace. Nothing is ever mentioned about discrimination in Muslim countries but our laws are used to promote the quasi political-religious movement. History has proven that Islam refuses to coexist with any other religion and that they will discriminate while demanding their "regligious rights" in America. Ellison, like Obama, espoused support for militant Black groups then changed their tune when running for national 0ffice. If you are a Minnesotan voting in the 5th District, it is time for you to forget all about your former party affiliations and from this moment on consider yourself an American first. As an American, do you want to see the nation our children inherit a bastion of freedom and opportunity, founded on principles of free speech, free thought? Or do you want them to inherit a country controlled by Islamic Imams and led by Jihadists? That is an honest, straightforward question. Which do you want for your children? Next, take a long, hard look at who has been representing you in Congress. It is an old saying, and one that rings true every time, that "If you show me who your friends are I'll tell you who YOU are." Congressman Keith Ellison has chosen his friends and they have chosen him. He accepts funds from organizations which aim to turn America into an Islamic state. His donors include groups like the Muslim Brotherhood, whose purpose is to instate Sharia in our courts and replace our freedoms and our Constitution with Islam. He is beholden to them and stands with them. We hear from our leaders that we should not regard all Muslims as "jihadists" or lump them together with so-called "extremists". The question is, if they are not in tune with jihad or Muslim extremism, then where are those who differ with that? Do we hear from them when an atrocity is committed by these jihadists? We see a lot of dancing in the streets and celebration by our "Muslim brothers" when 3,000 innocent Americans die in an unprovoked attack in New York City, but where are those good Muslim Americans and decent Muslim peace-lovers who denounce such an attack? They are mostly silent. Many of them profit by living in America and enjoying our opportunities here, but when we are attacked we do not hear dissent from jihad from them. An exception might have been Zuhdi Jasser, founder of the "American Islamic Forum for Democracy" (see above). And did Congressman Ellison endorse his criticisms and concerns - or even address them? No. He did not. He attacked Jasser instead, for not standing with Islam. 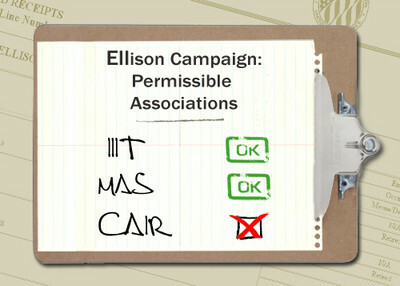 Islam equals anti-American values in Ellison's mind. And HE, Ellison, stands with Islam every time. Back to the question. It does not matter whether you usually vote for a Democratic or Republican ticket. It matters only whether youwant to see fundamentalist Islam and Sharia imposed on our America. If you prefer, instead, to live under the US Constitution which guarantees the freedom of men and women in America, you need to reject the candidacy of Keith Ellison. Also reject Keith Hakim, for this man uses other names. Ever wonder why this is? Your first and best opportunity to say "no" to institutionalized Islam in America is to vote in the Primary in August. DO NOT FAIL TO VOTE IN THE PRIMARY. You have the option to vote against Ellison and for BARB DAVIS WHITE, who does NOT intend to usher in Sharia, nor to accept financial contributions from anti-American organizations set to undermine our country's security. She will NOT support Jihad. She WILL SUPPORT the American Constitution and American law. Regardless of your erstwhile party affiliation, vote in the DEMOCRATIC primary in August and eliminate Keith Hakim Ellison from further consideration for Congress. Unless, of course YOU, TOO, support Jihad. I agree with you Marc. Vote the infiltrator out. Then stop whining on and on and on about it all the time... for crying out loud.. get rid of Ellison and crush any other terror funders and supporters and eradicate us all of these killers..